Sunlight has a subtle effect on asteroids, pushing them around ever so slightly. This Yarkovsky effect, as it’s called, is caused when sunlight is absorbed and re-emitted as heat. Now scientists have measured the precise change in an asteroid’s orbit caused by this. Asteroid 1999 RQ36 is about one-third of a mile wide (0.5 km). Its path around the sun has been altered by about 100 miles (160 km) over the past 12 years due to the Yarkovsky effect, the study finds. The orbit of the space rock — which crosses Earth’s path, presenting the remote chance of a future collision — was measured by the ground-based Arecibo and Goldstone radar stations in 1999 and 2005. Last September, another set of observations revealed the orbital change. The Yarkovsky effect is named for a 19th-century Russian engineer who first proposed the idea that a small rocky space object would, over long periods of time, be noticeably nudged in its orbit by the slight push created when it absorbs sunlight and then re-emits that energy as heat. The tiny effect is difficult to measure. "The Yarkovsky force on 1999 RQ36 at its peak, when the asteroid is nearest the sun, is only about a half-ounce — about the weight of three grapes on Earth,” said study team member Steven Chesley of the NASA Jet Propulsion Laboratory. “Meanwhile, the mass of the asteroid is estimated to be about 68 million tons. You need extremely precise measurements over a fairly long time span to see something so slight acting on something so huge." Because asteroid 1999 RQ36 hangs out in the vicinity of Earth, and could someday threaten to hit the planet, scientists are curious where its changing orbit will take it in the future. Chesley and his colleagues used the new measurements to show that the asteroid passed (or will pass) within 4.6 million miles (7.5 million km) of Earth 11 times from the years 1654 to 2135. In 2135, the space rock will make its closest brush with us, swinging by Earth at about 220,000 miles (350,000 km) away. That's closer than the moon, which orbits about 240,000 miles from Earth. What happens after that gets harder to predict. 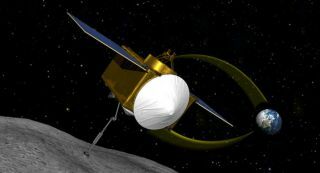 NASA plans to launch the OSIRIS-Rex mission in 2016 to collect a sample from 1999 RQ36 and return it to Earth. Chesley presented the findings May 19 at the Asteroids, Comets and Meteors 2012 meeting in Niigata, Japan.